"Surfsounds" is located on the eastern side of Porthtowan Beach, nestled into the cliffs of the dramatic north Cornwall coast. Porthtowan's large sandy beach is a surfers paradise and perfect for families, romantic getaways, walking holidays or for Writers and Artists getaways. Blue flag beach is only 50 metres away, patrolled by lifeguards in summer. Apartment sleeps 4/5. 2 bedrooms, 1 double, 1 twin, + sofabed. Fully fitted kitchen/living/dining room with sofa, comfy chairs and a flat screen smart TV. Patio doors to private veranda with table/chairs, perfect for watching sunsets and surf. Luxury bathroom with Jacuzzi bath and instant shower. Unlimited Internet. Free dedicated car parking nearby. During the summer we can only offer bookings for a full week with Saturday changeover. From November till Easter we offer short breaks with variable changeover days, 3 nights £180, extra nights £30 up to full week £300. Please note the price quoted by Owners Direct for short breaks may differ. My husband and I have lived in Dorset for 35 years and love the south west. We run our own company from home and also manage permanent lettings. We love Cornwall, having spent many happy holidays in our camper surfing and playing in the sea. 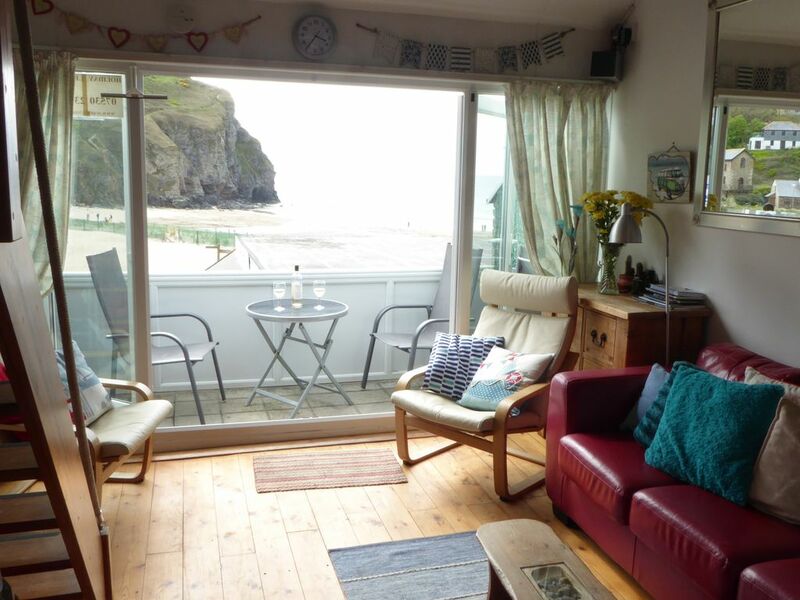 We rented an apartment in Porthtowan when our niece held her wedding reception in the Blue Bar. We were so taken with the apartment that my husband left notes with all the apartments asking if they wanted to sell - 18 months later we got the call, wow, how lucky is that. Its a fabulous spot in an unspoiled area of Cornwall and yet still handy for many attractions. The village of Porthtowan is small but has everything you need for a great holiday and, judging by the comments left by guests, you think so too. Luxury Bathroom with jacuzzi bath and shower, heated towel rail, wall fan heater, fully tiled. We now provide one hand towel and one bath sheet per guest at no extra charge, but please bring your own beach towels. Living room with large leather sofabed and two comfy chairs, Flat screen TV/ DVD and soundbar with blue tooth, stereo, large folding dining table and chairs. Tehidy Park Golf Club, Perranporth Golf Club, Nigel Bicknell Professional, Truro Golf Club, Killow Golf Club, Holywell Bay Golf Club, Newquay Golf Club, W. Cornwall Golf Club & Jason Broadway Golf Club are all within 16 miles. Notes on accommodation: Heated by electric radiators, immersion heater for water and an instant shower. Warm and cosy, even in winter. It's paradise for children and we are very happy to accommodate them. Outside: Communal sloping gardens. Veranda is best place to sit. Cleaning / Towels / Linen / Maid service: Bedlinen, towels and tea towels are provided. Please bring your own beach towels. The property is cleaned and bed changed weekly. Further cleaning can be arranged at cost. Other: Balcony overlooking beach with table and chairs. We accept short bookings during winter - Nov-March; 3 nights £190, 4 nights £220, each additional night £25. Fantastic accommodation with fantastic views. Birds eye 20 metres, on foot 50 metres. Nearest airport is Newquay. Perranport has an airfield for private pilots, 10 minute taxi ride to apartment. Use of car is recommended to explore the many attractions, although not necessary as village has shop, fish & chip shop, post office, pub and surfers bar serving excellent local food. There is a bus service. Tate St Ives 12 miles. Cornish Cyder Farm 5 miles. Holywell Bay Fun Park 8 miles. Flambards Theme Park 14 miles. Blue Reef Aquarium, Newquay 14 miles. 5 National Trust Properties within 16 miles. Blue Bar on beach with live music most nights in the summer, serves lovely local food, with WiFi service available. Unicorn family pub. Cafe. Surf School - courses + wet suit/board hire. Village grocery shop. Post Office. Fish & Chip shop.